From 8/4 hard maple stock I cut all the blanks for the two tables' legs and straight aprons. 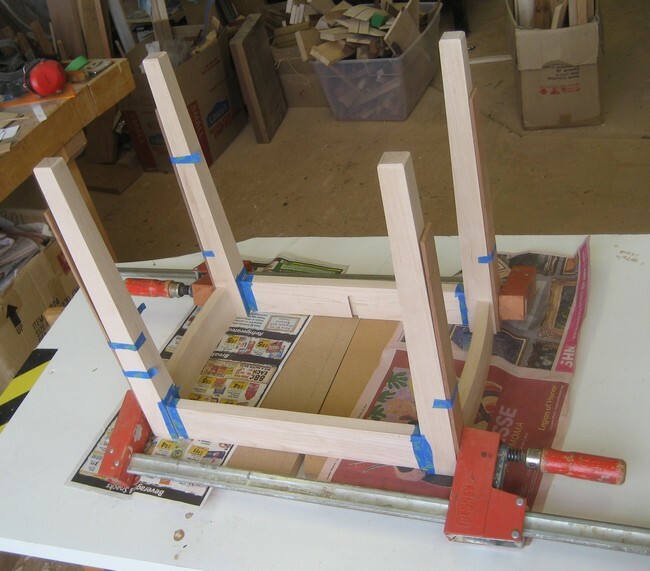 Then using the full-scale schematic I lay out the locations of the mortices and figure the lengths of the tenons. 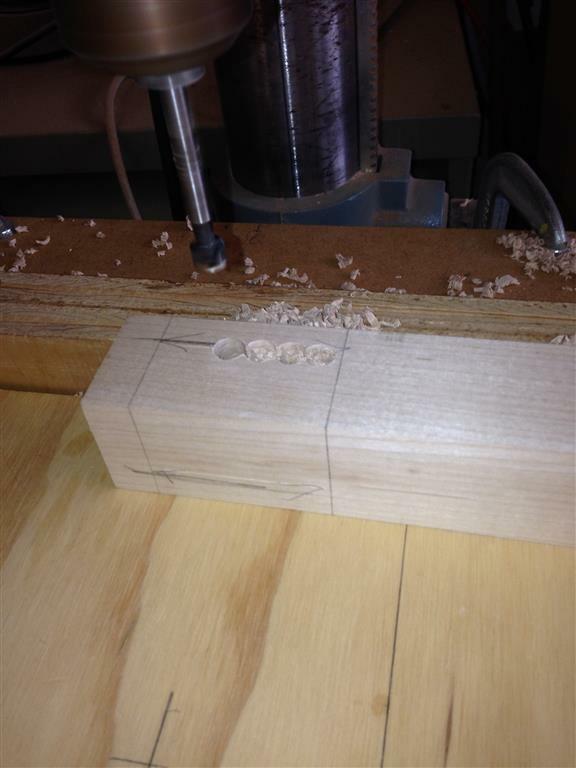 For each leg I determine the best orientation of the grain, and then mark the locations of the mortices. 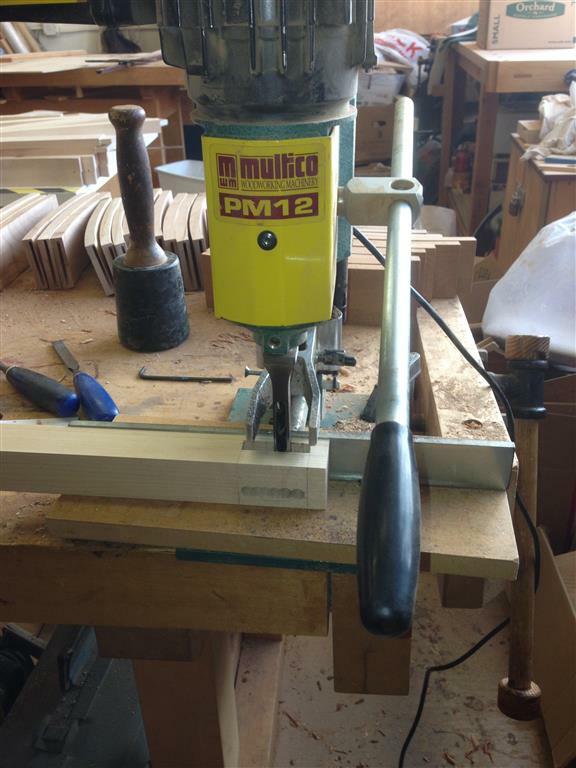 Using a drill press I can hog out most of the mortises before going to the mortising machine. The mortising machine cuts very precise square sided holes, but it cuts slowly. Hence the need to hog out the mortises in the step above. 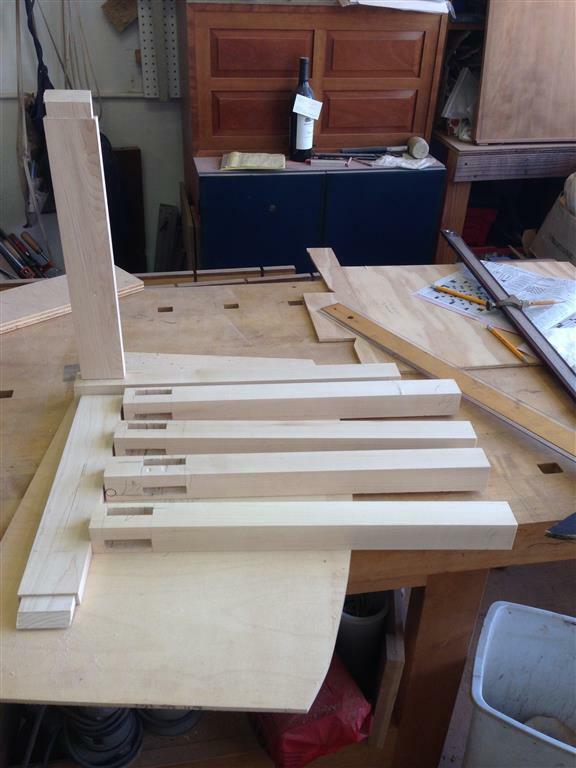 Next step is to lay out and cut the straight aprons to length and width, and then cut the tenons that will go into the mortises in the legs. 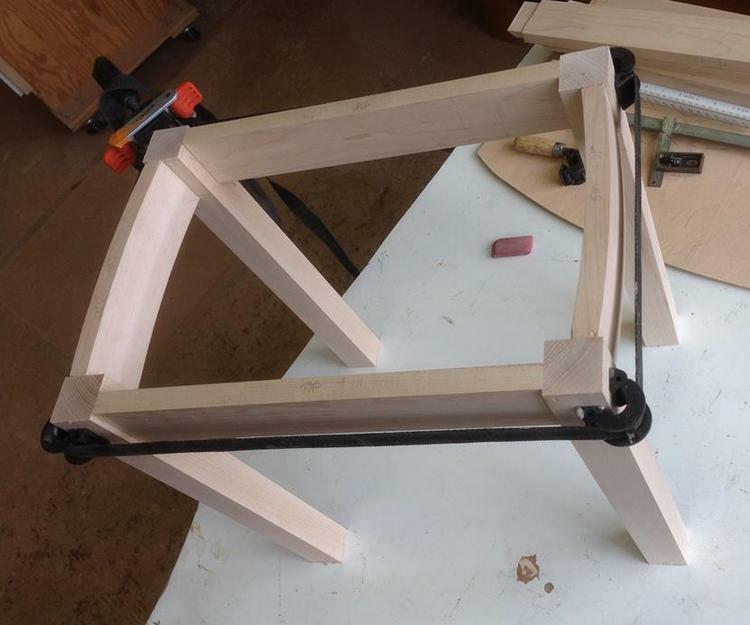 I use a tenoning jig on the table saw. 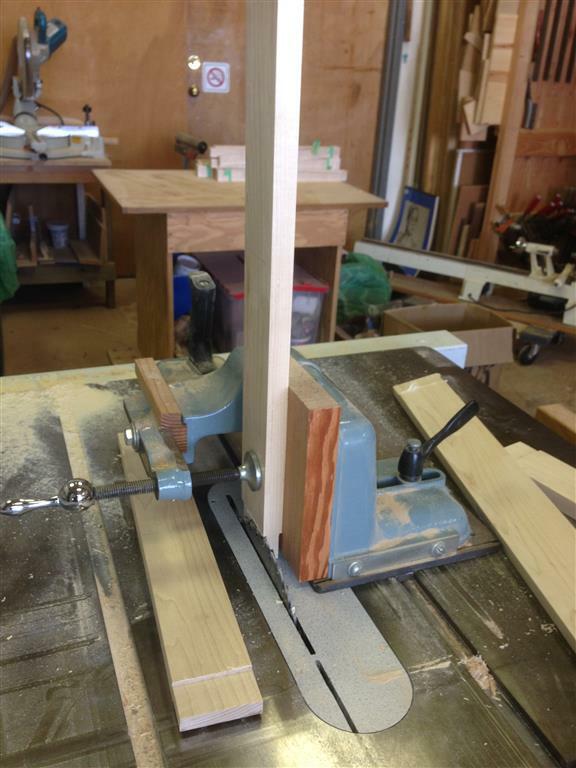 The tenoning jig holds the apron vertical and the jig can be set to cut the wide shoulders of the tenon. The narrow shoulder are cut by hand. 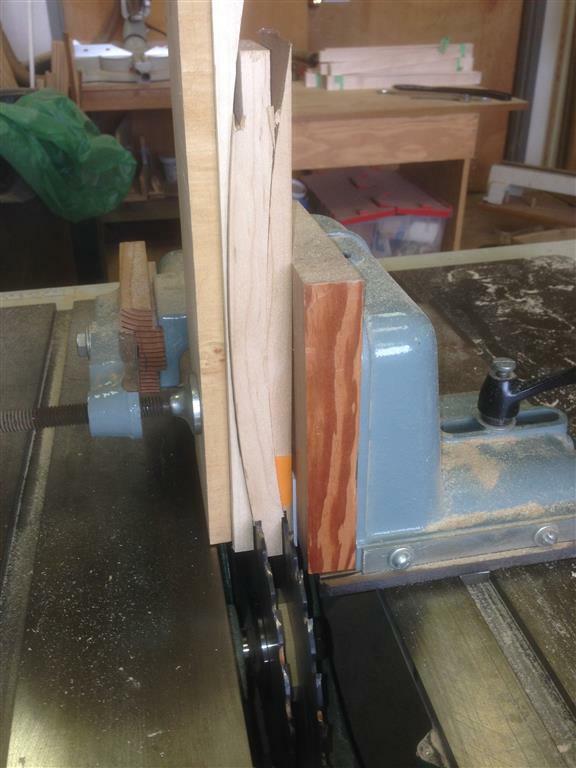 With the mortises cut, I can now turn to tapering the legs. 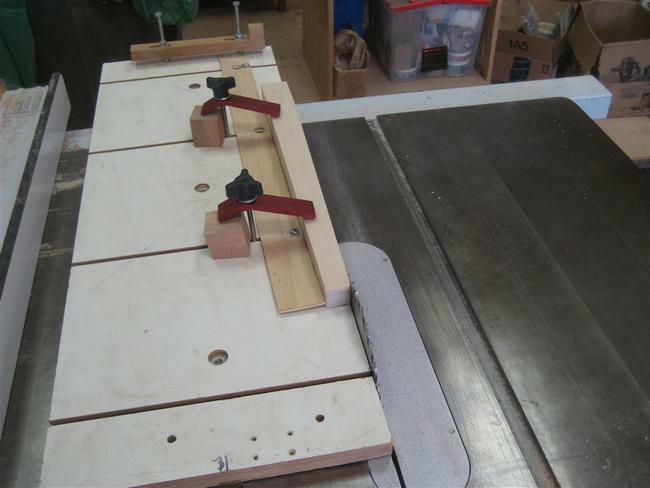 I use a tapering jig on the table saw that is very accurate in setting the taper angle. 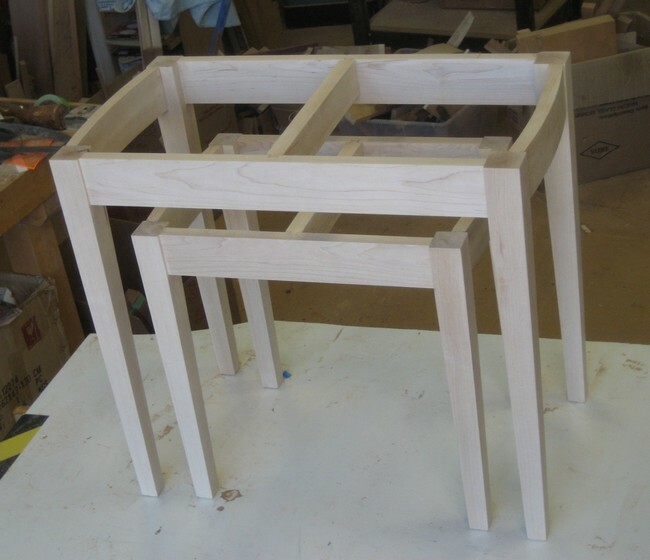 With the legs and the straight aprons completely shaped, it's time to shape the aprons at the ends of the tables. 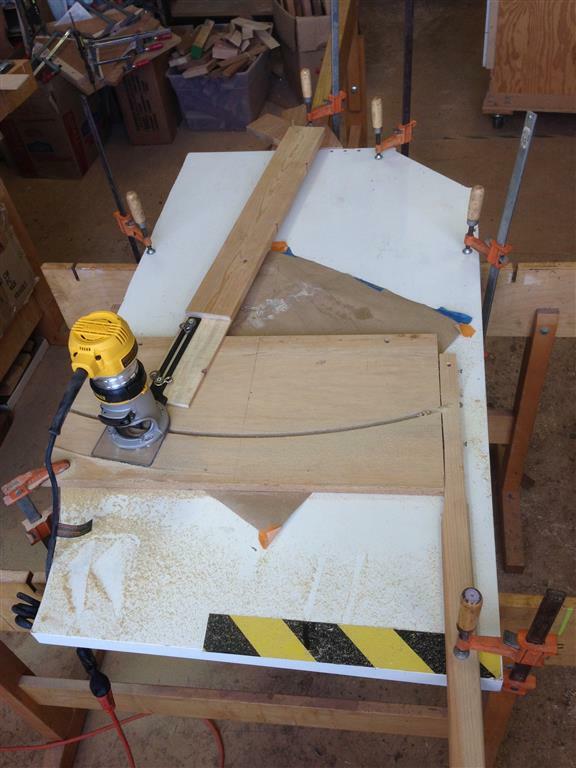 Since the ends of the table tops will be curved, the end aprons need to be curved. 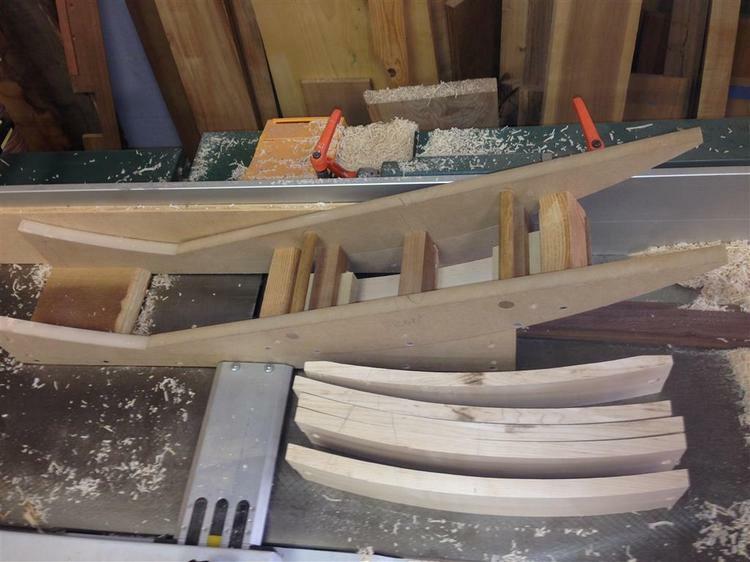 At first I rough-cut the apron arcs from 8/4 hard maple. 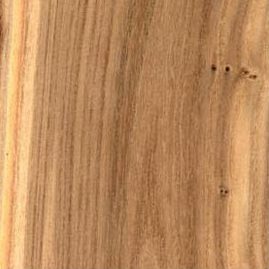 But the resulting grain pattern was harsh since it cut through grain lines. So I glued up two 14" lengths of hard maple in a bookmatch pattern. This enables me to cut the curves across the grain, not with the grain. This has the effect of making the grain run at right angles to the curve, and therefore reduces the wildness of the pattern. After cutting the curved blanks, I then cut them to apron width centered around the glue line. This aligns the show grain in the aprons in a pleasing pattern. Next I rough cut all the aprons on the bandsaw and sand the inside curve on a drum sander. 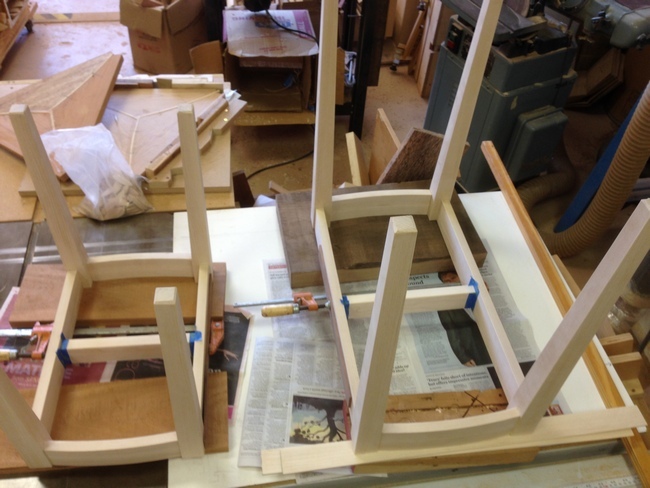 After prelimary sanding, I am now going to glue the table/apron assemblies together. I'll do this in two steps. First glue the ends of the tables together making sure that all the dimensions are held and legs are straight. 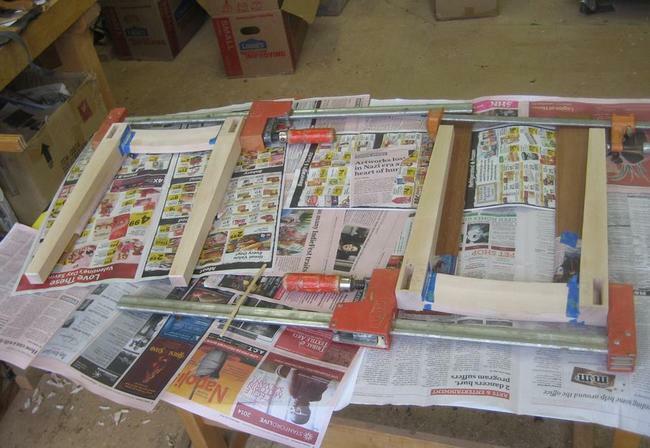 Then glue the ends together with the straight aprons to complete the bases of the tables. After cleanup of the end apron/leg combinations, I glue the ends together with the straight aprons to complete the bases of the tables. Now cut center bars that will keep the table top flat. 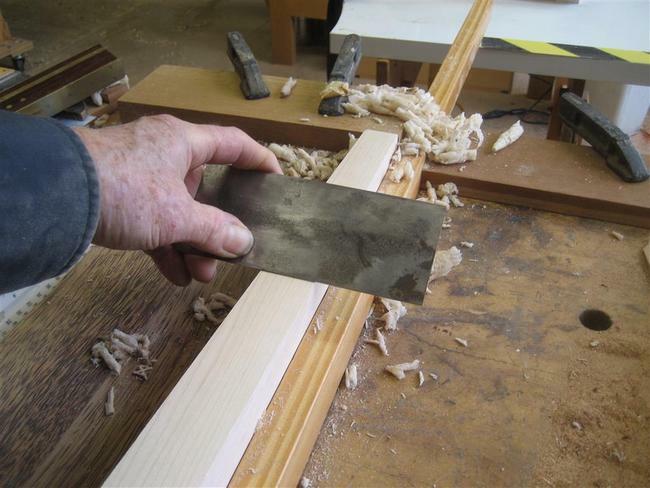 Cut to length and join with aprons using dovetail joints. The table bases are nearly complete - just awaiting final sanding. Now it's time to turn to the tops.